Tour lasts Approximately 2 1/2 hours. 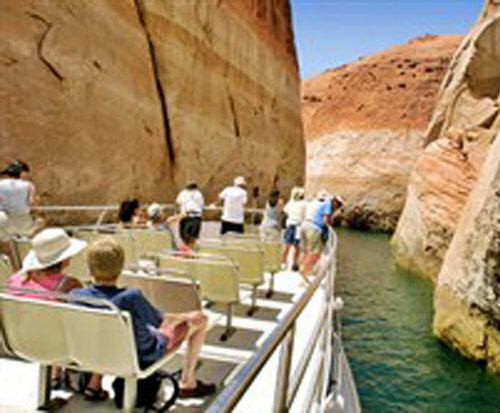 Take a picturesque boat ride that encompasses both Navajo and Antelope Canyons as you embark on a visual odyssey when you take the Canyons Adventure Boat Tour. Along the way your knowledgeable crew will provide an interesting and informative narration about the area and the formation of the canyon. They will answer any questions you may have on your journey. The luxury cruise yacht has a choice of seating. Enjoy the fresh air and sit on the open upper deck. Or if you prefer you can sit inside and enjoy the panoramic views from the 360 degree windows. 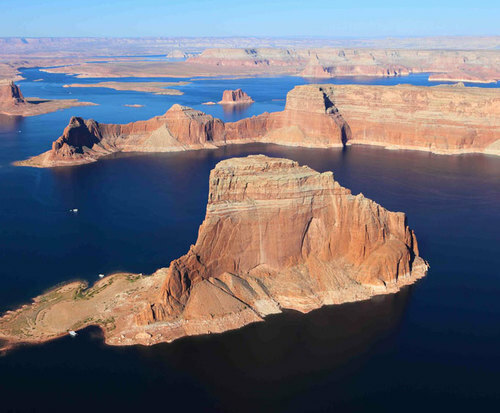 Cruise past the Glen Canyon Dam and see impressive panoramic views of the giant Tower Butte. Visit the twisting Antelope Canyon, a side-arm of Lake Powell most commonly known for its spectacular coloration and its scenic slot canyons with rugged terrain that provides an enticing adventure. The Canyon's kinks and bends will draw you in and the towering walls of sandstone on either side of you will keep you peering around the next corner.This relaxing excursion will give you many photo opportunities as your venture continues. The highlight of your tour is Navajo Canyon and its beautiful Navajo Tapestry laden walls. Navajo legend tells us that the colors were formed by the blood of a monster killed in this region. The canyon twists and meanders 15.5 miles past 600' high walls laden with Navajo Tapestries; iron oxide and manganese residue from the above, now eroded, beds of shale, that have 'draped' down the sides of the canyon walls. 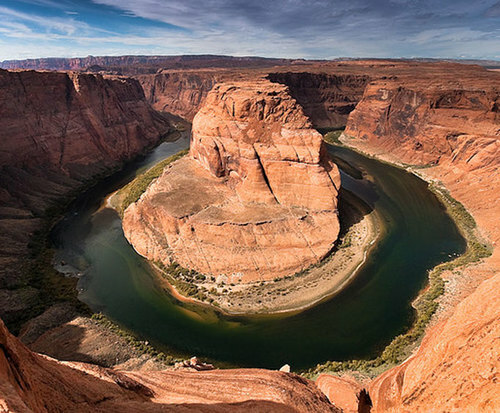 One of the longest of Lake Powell's 96 major side canyons, Navajo Canyon is also one of the only side canyons to have been a tributary of the Colorado River. This is such an amazing experience. The sights are truly breathtaking.